How cute is this shirt from Lavish Alice? I'm always moaning that the shirts I own don't have detailed cuffs so I'm so excited to finally own one. I wore it again to lunch with my brother today and kept shoving it in his face and telling him how nice a colour it was which, strangely, I think he got bored of pretty quickly. Emerald's one of my favourite colours so I piled on this necklace from H&M and my Story ring like some sort of colour co-ordinating maniac. Anyway, enough about me and my emerald fetish, Lavish Alice have just had a massive drop of new stuff and it's pretty amazing if I do say so myself, you can check out the full collection here. Now that I'm finished uni I've finally got round to the mammoth task of clearing out my wardrobe so have been adding a few bits and bobs to my blog sale here. There'll be more added over the next couple of days too once I get into the swing of thaaangs. That colours of that shirt are so beautiful! And that shirt is b-e-a-utiful! Great colour! perfect styling as always Amy! Beautiful outfit! 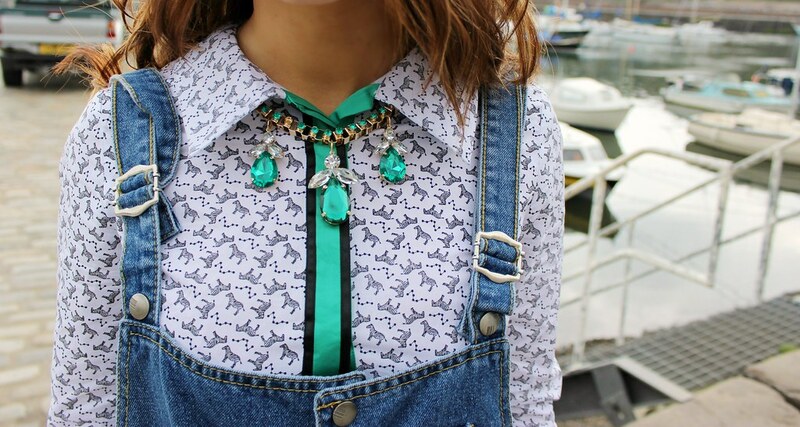 The print on the shirt is so cool and the necklace is just gorgeous. Hats just make everything so much better, don't you think? You look great I love your shirt. I can't believe he git bored? Love everything about this outfit you look amazing!!! Oooh, this is just the cutest! I love how you've styled it and your hair just looks perfect. Beaaaautiful. I love your dungarees so much! I really really love this outfit! You look amazing! We love your style over here at Cagecity. We are loving your dungarees such a cute outfit. I'm wearing a dungaree dress today here in the office and I may be stuck in doors but I feel so summery.